Waterpik Aquarius vs Ultra: Which One is Worth your Money? 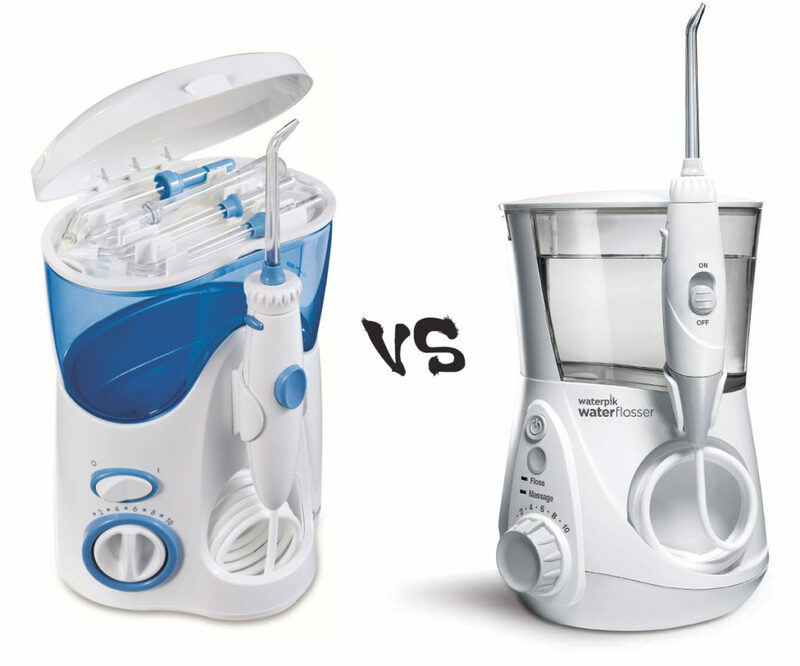 Both the Waterpik Aquarius and Waterpik Ultra have stellar reputations as tried and true products that eliminate plaque and thoroughly clean your teeth and gums. Yet, the water flosser market has been stale for a while, and it can be difficult to discover a product that provides some much needed innovation to the scene. So between these two leading products from Waterpik, the Waterpik Aquarius vs Ultra, which one reigns supreme? Since the Waterpik Aquarius is newer than the Ultra, we will have to look at it with more scrutiny. What innovative features does it provide that the veteran Ultra doesn’t have? The biggest features are what we consider quality-of-life improvements. First, the Aquarius Professional has a 30 second timer. This does not increase the water flosser’s ability to remove plaque, but it does help the user manage their time better when flossing. If you are someone who tends to floss one area too long or too quickly, the timer helps you pace yourself better by indicating when 30 seconds have passed. Once the timer goes off, you can move on to the other half of your teeth, ensuring that both halves get an equal 30 seconds of flossing at a minimum. Another two features of the Aquarius Professional are the LED indicator as well as the hydro pulse massage mode. Again, this does not necessarily improve the cleaning potential of the Aquarius Professional, however it can provide the user with some enjoyment by giving their gums a stimulating massage. While active, the flow of water will occasionally slow down to a relaxing stream of gentle pulses, which supposedly stimulates the blood flow to your gums and strengthens them. If you are someone with sensitive gums, perhaps this feature will appeal to you. The Waterpik Ultra water flosser does not have any of the features mentioned above. In the battle for superiority between these two titans from Waterpik, the lid and tip storage is where the WP-100 Ultra Water Flosser has the advantage over the Aquarius. First, its lid is removable so that it won’t get in your way when you are filling up the water reservoir. The tip storage is actually built into the lid and easily accessible. You can store up to 4 additional flosser tips, as opposed to the Aquarius Professional, which can only store 2. The Aquarius Professional has its own tip storage area as well; however, we feel it is harder to use than the Ultra’s. For starters, it is located inside the machine, beside the water reservoir. This design was probably the result of Waterpik wanting to make the Aquarius Professional look slimmer. Indeed, the product is slimmer, but at the expensive of functionality and usability. You cannot remove the lid from the Aquarius (WP-660) since it is attached to the body of the flosser. Some people don’t mind this, however it does get in the way of the water tank when you want to remove it to fill it up in the sink. The biggest criticisms of the Waterpik Ultra WP-100 are usually directed to its hose and handle. The hose is slightly longer than the Aquarius’ by an inch (54” when fully lengthened), and for most people this is not something they will even notice. However, the flosser handle has some glaring issues. First, the pause button that stops the stream of water is unresponsive and hard to activate. Second, you need to keep the button pressed down, which is quite tiring and people often accidentally loosen their grip, causing water to flow again at inopportune times. With the Aquarius, Waterpik have addressed most of the hose and handle issues that are prevalent in the Ultra WP-100. First, the hose is slightly longer to give you more room when flossing. Second, the stiff pause button issue has been significantly improved, though not totally fixed. Rather than a pause button, the handle now has a pause slider. By sliding the slider into the “off” position, the flow of water will be shut off without the need to continuously hold it down. Unfortunately, the slider is quite stiff as well, but this is a step in the right direction. In practice, however, most people simply turn off the device if they want to stop the flow of water in both the Aquarius and Ultra, so perhaps these extra features are not even a real benefit in the first place. Lastly, we felt that the holder for the hose and handle in the Ultra was more spacious and easier to put back, whereas in the Aquarius there is less room and may require some fiddling to put it back in its place. Let’s be honest, we are superficial creatures and we want the things we own to look nice as well. And when it comes to looks, the Waterpik Ultra WP-100 is woefully outdated because it is over a decade old and looks the part as well. The Aquarius Professional WP-660 looks like a product that belongs on your bathroom counter in this day and age. Fortunately, Waterpik offers both of these products in two variants: black and white. And personally, we feel that getting the black version of the Ultra makes it much easier to bare, however the color black does have the issue of looking dirtier much more easily. Pressure Settings: Both devices have 10 pressure settings that let you customize your flossing experience. Customers with sensitive gums can use low pressure settings, and those with a higher tolerance can go full blast. When selecting the appropriate pressure setting, you have to consider the condition of your gums. If you have gingivitis, for instance, using too much pressure can damage your gums and cause bleeding. Water Capacity: On the highest pressure settings, both the Aquarius and Ultra can provide you 90 seconds of continuous flossing. For most people, this is more than enough time. If you want to extend that time without refilling the reservoir, simply use a lower pressure setting. Rotating Flosser Tip: Both flossers have a 360-degree rotating tip to help you get the perfect angle to clean hard to reach areas of your teeth and gums. Covered Reservoir: It is important that no contaminants get inside the water reservoir, since this water is going to be pumped straight into your mouth. Good thing both models have a secure lid that will keep any bad stuff out. You will still have to remove the reservoir and wash it frequently. Voltage: Both water flossers can only operate with North America voltage. If you are planning on travelling abroad with your water flosser, you will need a universal voltage adapter. Flosser Tips: Waterpik have designed most of their countertop water flossers with removal flosser tips so that you can replace or swap them for one of their other flosser tips. Both the Ultra and Aquarius come with a suite of their own tips: Classic Jet, Plaque Seeker, Pik Pocket, Orthondontic, and Tongue Cleaner. And of course, they are all interchangeable and provide you with more options to clean your teeth and gums. Long Cord: Both Waterpik products have ample cord lengths. The Aquarius’ cord stretches 53” long, wheras the Ultra has a cord length of 54”. If for some reason you really need that extra length, go for the Ultra. Waterpik Aquarius vs Ultra: Who is the Winner? Though the Aquarius is a newer model that has some extra features that the Ultra doesn’t, none of it is ground-breaking enough to outright claim a clear winner. Both the Ultra WP-100 and Aquarius Professional WP-660 are excellent at removing plaque and cleaning your teeth and gums; you cannot go wrong with either. With that said, they are not without minor flaws. For instance, the Ultra’s handle leaves something to be desired with its poorly designed pause button. And the Aquarius’ tip storage area is smaller and harder to reach compared to the Ultra. The Waterpik Aquarius has a more modern design and adds some new features. The Waterpik Ultra gives more bang for your buck, if you do not care for fancy new features. If looks matter, then choose the Aquarius. If not, then choose the Ultra.